In a flash, Maddie’s life is unrecognizable. No more stressing about college scholarships. Suddenly, she’s talking about renting a yacht. And being in the spotlight at school is fun…until rumors start flying, and random people ask her for loans. Now Maddie isn’t sure who she can trust. Except for Seth Nguyen, her funny, charming coworker at the local zoo. Seth doesn’t seem aware of Maddie’s big news. And, for some reason, she doesn’t want to tell him. But what will happen if he learns her secret? Kasie West is a go-to author for die-hard lovers of the YA Romance Contemporary genre. Tons of readers recommend her books, and my friends can easily attest to that. And I can’t thank my friends Hazel from Stay Bookish and Inah from The Bibliophile Confessions enough for urging me to read her books. I’m a contemporary lover through, and through and books like Lucky In Love literally give me life. And I’m so excited to share with you all my thoughts and opinions on Kasie West’s latest book, so read on to know what I think of this swoon-worthy novel. 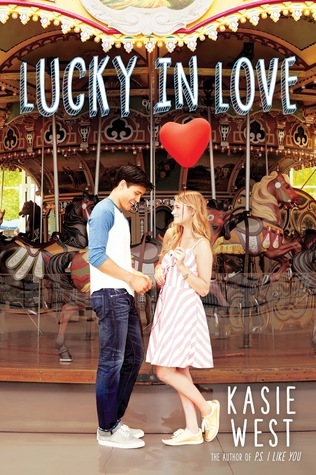 Lucky In Love is my 2nd Kasie West book next to By Your Side, and this happens to be my favorite of hers so far. I love her writing style, and I’m impressed at how she tackled a personal and sensitive topic. To write about a good family dynamic might be hard for some authors, but not to Kasie West. In Lucky In Love, we get to know such a relatable family with real-life problems which made them really unforgettable, and very easy to root for. And to add to that, I also liked how this book tackled social topics like friendship, and the importance of trust in every type of relationship. Obviously, there’s lots to love about this book. Maddie’s overall character development is one of the many reasons why I really enjoyed Lucky In Love. Towards the beginning of the story, there’s no doubt that she’s just your average teenager trying to maneuver her life, balancing school, family, and a social life, all while having to deal with finances, just like the rest of us. At that point, there wasn’t anything about her that stood out for me, really. But after winning the lottery, AND after realizing all the important things that came with being THAT rich, she turned into a smart, lovable heroine, and I can’t help but root for her. I love how resilient she is all throughout the book, and I definitely appreciate how much she valued her family over anything else. Lastly, the undeniable chemistry between Maddie and Seth hands-down won if for me. There’s no doubt that Kasie West has great talent when it comes to writing love stories, but Maddie and Seth’s is just a whole new level, even for her. I loved Maddie and Seth both as individuals, and as a couple, and I literally have no words to describe just how much I ADORE them. All of the scenes that involved their dialogue are my favorites: from their time at the local zoo, to their study date, and ahhhhhh! I’m a stan for them, and I think to say that I’m obsessed with this OTP would be a oversimplification. Have YOU read Lucky In Love? How was it for you? What’s your favorite Kasie West book? Tell me all about it via the comments section below! A stay-at-home mom of four children, three of them girls, ranging in age from four to 12, Kasie West hears lots of melodramatic versions of large-than-life events. She graduated with a BA in liberal studies, with a strong focus on linguistics and psychology, from Fresno State University. She lives in Fresno, CA. Her books are The Distance Between Us, On The Fence, The Fill-in Boyfriend, P.S. I Like You, By Your Side, Lucky In Love, and Love, Life, and the List. Her forthcoming book, Listen to Your Heart, is set to be published on May 29, 2018 by Point. Visit her online at http://www.kasiewest.com. Follow me around the internet! Sounds like an awesome, heartfelt book. I know this has been out for a while, but I haven’t had the chance to read it yet. I’ll bump it up in my TBR, thanks to your review. Thanks! I’ve read this last year, and would have to agree with most of your points of interest! Great review!